Holliday, who died in 1965 at age 43, wasn’t merely a “smart blonde”—she was a comedic powerhouse. In the stage directions of this new play, Holtzman describes her as “incandescent,” which is something inborn that defies easy description. Adept at comic rhythm and timing, Holliday had a quirky, smoky voice and remarkable vocal control. On top of that, she was the kind of disciplined artist who could replace a star on a few days’ notice, as she did when Jean Arthur fled Born Yesterday just before the opening of the Philadelphia tryout, and be letter-perfect from the start. 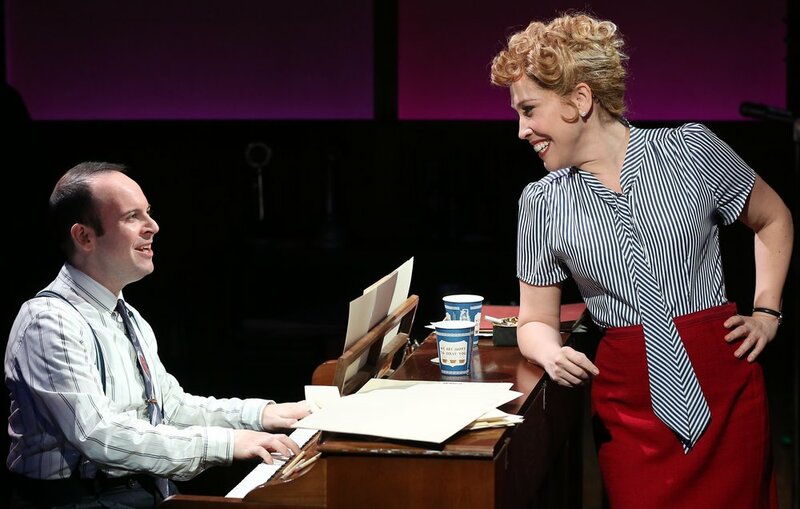 Andréa Burns (right) as Judy Holliday and Jonathan Spivey as Leonard Bernstein in Willy Holtzman’s Smart Blonde at 59E59 Theaters. Top: Burns as Holliday and Mark Lotito as David Oppenheim. Smart Blonde is a series of vignettes, mixing songs, humor, and a few pratfalls with Holliday’s melancholy biography. The narrative frame is a 1964 recording session—Judy (Andréa Burns) and her boyfriend, jazz saxophonist Gerry Mulligan (Mark Lotito), are about to make a record that represents their debut as professional collaborators. While preparing for the session to start, Judy keeps her ear cocked for a telephone call from her oncologist. She’s anticipating news about recent tests for the possible recurrence of cancer. On edge about the future, Judy reflects on various episodes of her past. As she does, they materialize on stage. There’s early life with mismatched parents in Sunnyside, Queens; her determination to be an actress; and sundry ups and downs in show biz and love. Judy’s recollections include a rogue’s gallery of distinctive characters, such as the brainy uncle who introduced her to leftist theory; a wily chorus girl who dated Holliday’s father and became the model for her characterization of Billie Dawn; and Yetta Cohn, the New York City policewoman with whom Holliday had a long-term romance. Prominent in Judy’s memory is her 1952 appearance, under subpoena, before Senator Patrick A. McCarran’s Internal Security Subcommittee. McCarran and his cohorts were investigating ostensible subversion of the U.S. government by American citizens, and Judy had been fingered by the scandal sheet Red Channels as a possible Communist or Communist sympathizer. In a flashback, Burns enacts Holliday’s desperate attempt to avoid answering the subcommittee’s questions about her acquaintances, including questions about her relationship with Yetta. Ultimately, Judy defies the senators’ veiled threats by assuming the persona of Billie Dawn, feigning the naiveté that audiences, including members of the subcommittee, adored. Burns (foreground) as Holliday and Andrea Bianchi as Marilyn Monroe in Smart Blonde. Photos by Carol Rosegg. At numerous points, Smart Blonde tugs at the heartstrings, but many of its brief, zippy scenes are reminiscent of the comedy sketches Holliday cowrote and performed with her fellow members of The Revuers. That legendary comedy troupe, popular at nightclubs in New York and Los Angeles in the late 1930s and early ’40s, included Betty Comden, Adolph Green, and, as intermittent accompanist, Leonard Bernstein. Those three, along with other boldfaced names, crop up in Smart Blonde. Directed at a breakneck clip by Peter Flynn, this production features four superb actors—in addition to Burns and Lotito, Andrea Bianchi and Jonathan Spivey. Burns plays Holliday throughout, while the other three take on a variety of roles. Bianchi shifts rapidly from being Judy’s mentally unstable mother to Yetta; Kanin’s wife, actress Ruth Gordon; and Marilyn Monroe (among others). Spivey is Bernstein one minute, Kanin the next, then Columbia Pictures chief Harry Cohn. Lotito toggles among Green, David Oppenheim (Holliday’s husband), and Mulligan. The relentless doubling works like gangbusters thanks to split-second changes in demeanor and costumes (resourcefully designed by Michael McDonald), and despite the fact that the three actors who double aren’t suited by age or appearance to all the roles they play. The evening’s greatest pleasure is watching these comic pros transform themselves like chameleons every few minutes. Burns is a superb singer—far more distinguished as a vocalist than Holliday was. She delivers the show’s 10 songs, mostly standards, with flair and feeling. And she gives a creditable imitation of Holliday in the gin rummy scene from Born Yesterday. But no one can replicate Holliday’s idiosyncrasy, a quality as hard to describe as the incandescence Holtzman mentions in his script and just as valuable. Smart Blonde is at its best when the cast is singing (and especially when they’re mimicking The Revuers). What’s disappointing is that, in this tour of Holliday’s biography (at once lightning-fast and bland), Holtzman affords the talented actors ample room for caricature but gives them scant opportunity for characterization. Smart Blonde runs through April 13 at 59E59 Theaters (59 E. 59th St., between Park and Madison). Evening performances are at 7:15 p.m. Tuesdays to Saturdays; matinees are at 2:15 p.m. Saturdays and Sundays. For information and tickets, call (646) 892-7999 or visit 59e59.org.